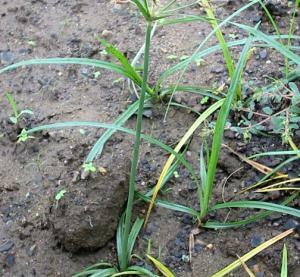 This weed will crack you if you don't crack it..... Cyperus rotundas aka nutgrass is the bane of gardeners worldwide. It has various names - Java grass, purple nut sedge, Wintjiekweed or red grass, red nut sedge, Khmer kravanh chruk, Teki and Motha to name a few. This weed is actually referred to as being 'the world's worst weed'. Known for its tenaciousness it can shoot through asphalt as well as pierce through pool liners, so we know we are looking at a biggie of the weed world here. More detail can be seen at wikipedia. This post was prompted by the overwhelming presence of nutgrass in our garden. A seemingly endless task to attempt to curb its spread - more on this later. It is a species of sedge believed to be native to Africa, southern and central Europe and southern Asia. It is a perennial plant that may reach a height of up to 20-50cm. The name is derived from its tubers, that somewhat resemble nuts (although botanically they have absolutely nothing to do with nuts). These little nuts can remain dormant (or inactive) in the soil for up to 10 years! So folks looks as though we may be for a long haul. If spikelets are allowed to form they will be reddish-purple colour but this is really not the best way to make positive identification. Very carefully dig down to the roots and feel for a hair-like stolen which will lead to a nut forming a chain of growth to more plants, if you have this - ta-dah you've got nutgrass! Pull up the green growth with roots intact - don't worry about the nut at this stage. Wait for new growth to appear and while it is still young spray it with Sempra which has a 'fixer' added eg Eco Oil. This method may require a couple of applications, however it has a proven success rate in our vegetable garden when nutgrass took off like a startled rabbit after some dodgy mulch with seeds had been applied (well we think this is how it happened as it was so prolific throughout the garden). All that is left to do is address this weed in the rest of the garden..... not an easy task as it has established itself quite nicely among closely planted flowers and shrubs. Further information can be obtained by reading Brisbane City Council Weed Identification.